In the heart of Berlin the final conference of the European project Digital literacy 2.0 took place on February 22th, 2014. More than hundred interested participants flocked to the halls of Hotel Aquino, where the event started at 10.30 a.m. with the welcoming of the project coordinators from Stiftung Digitale Chancen. The objective of the project Digital Literacy 2.0 (DLit 2.0) is to empower socially and educationally disadvantaged adults in Europe to participate in society more strongly by actively and autonomously using web 2.0 applications for their individual purposes. 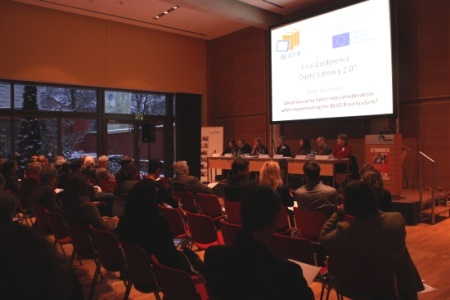 Therefore eight partner organisations developed and tested in seven European countries the training “Digital Literacy 2.0'' in the last two years. In the last steps of the project the final conference showed the training campaigns in the countries, the training outcomes and possible applications of the material. Representatives of governmental and non-governmental organizations, multipliers and facilitators discussed together in workshops future usage of the “Digital Literacy 2.0'' training material and participated in a fruitful panel discussion in the evening. In coffee and lunch breaks visitors were informed of related and for this target group interesting other projects by poster presentations. The presentation of the European project Trans e-facilitator were highly visited and acquired new trainees for its online training, which starts in February. Because of the Train-the-Trainer approach of the projects Trans e-facilitator and Digital Literacy 2.0 both projects aim at enabling people to facilitate digital literacy among their peers.